The rising star in the world of Rugby League admits that he never saw himself pulling on the green and gold of Australia this early, but many believe that Sione Mata’utia is more than ready to represent his country on the international stage. “When opportunity comes knocking, you kick down the door and take it with both hands,” the young star said to reporters during training for the Four Nations competition. Mata’utia believes that the achievements that he has already forged can be attributed to a decision he made a few years ago. “My ultimate goal is to make my Mum happy, to make sure she is proud of what we’ve done,” he said. The youngest Mata’utia debuted for the Knights in the 20th round of this year’s competition, when the Knights recorded an upset win over the Sydney team. Sione debuted alongside his older brother Chanel in the same game, marking the first time that had happened in the rugby league since 1942, in the NSWRL. The pacey winger agreed that the fans have welcomed him and his brothers with open arms, and that it has been a pleasant surprise to see the admiration in their eyes, especially after he was picked recently to play in the Prime Minister’s XIII in Papua New Guinea. Sione in Papua New Guinea for the Prime Minister’s XIII. “We walked out [of the airport] and there were people there screaming names and touching you,” he said. The meteoric rise of the Liverpool-born star was not a surprise for some, and after his performances in the Under-18s New South Whales team that saw the younger representative team to victory, many believed that Sione had what it took to break into the first grade team, fresh off their first series win in eight years. 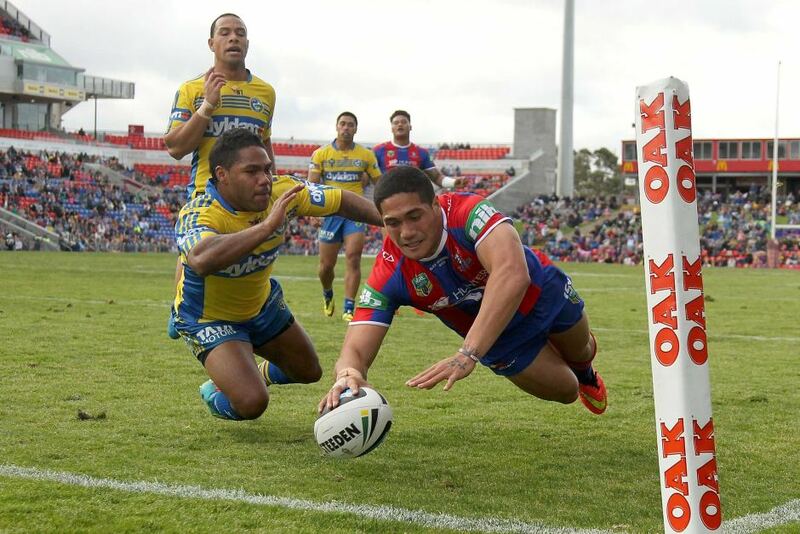 Sione scores in the 25th Round against the Eels. Sione attributes much of his amazing talent to the trainers at the Hunter Stadium, including Colin Sanctuary. “There have been a lot of trainers who have really helped me including Colin Sanctuary, he was a big help when I was younger,” he said. He also recognised Knights trainers Dave Ballard, Grant Duthie and Jeremy Hickmans who assisted him through pre-season and his NRL debut. “Off the field, Phil Matthews really helps me with TAFE and getting into study and getting my life ready for life after football,” Mata’utia said. One thing’s for sure when it comes to the rising star – you can be garaunteed that he will continue showing an exceptional flair and skill on the field, and there can be no doubt that the young player will be appearing in the Blue of NSW before the next five years is up. If I was Laurie Daley, I would hesitate when considering leaving Sione out of the starting line-up of the next State of Origin side, and it may be a mistake for the Maroons to not consider him as a threat at all. Sione may well be the leader of the next generation of Australian and world-wide talent, and I would not surprised to see him wearing the captain’s armband in the Four Nations and beyond in the years to come. I for one will be charting the young Australian’s rise in stardom, from his first debut in the Hunter Stadium with an upset, all the way to an eventual Dally M award that is shining in his future. Australia Vs. New Zealand 7:30pm (GMT + 10) Suncorp Stadium, Brisbane, Australia.